Europe’s most magical cats battle for their nine lives! 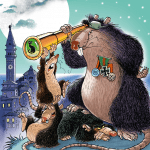 In this first chronicle, the wild cats encounter the ghosts of Piran–and the wicked General Rat! Join the beautiful Queen Felicia, faithful warrior Dragan, and the feral feline family for nine tales of adventure and enchantment. 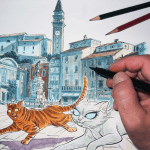 The first in a series of nine chronicles concerned with a colony of courageous if also rather lazy feral cats that live in a small seaside town on the Adriatic. Indeed, Piran is a kind of miniature ‘Slovenian Venice’: a forgotten place – at least in the eyes of humans. Every day, the wild cats work the tables of the restaurants along the seafront promenade, hunting for scraps; and the pickings are rich. Life is good in Piran. In the animal realm, and in the sphere of the supernatural, things are rather different. No one knows that better than Felicia, Queen of the wild cat colony. In the summer which our story begins she is presented with a perfect storm of troubles, for there are strange forces at work in this genteel town. For one thing, Piran’s rats have become mysteriously evolved lately, and are mobilizing under their leader, the sinister ‘General Rat’. As well as the newly formed rat army, there are the town’s Ghosts and worse, meddling and incompetent humans to deal with. Can Felicia hold her clan together, against all odds, or is their idyllic way of life doomed to extinction? 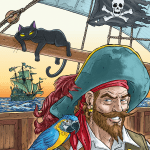 The answers, some of them anyway, are in the first set of nine tales bound to please literary cat lovers of all ages. Filled with vibrant full colour illustrations, each chronicle is best enjoyed over a long morning, afternoon or evening in a snug armchair. Renaissance man or a dilettante, you be the judge – Scott Alexander Young is a busy working actor, as well as a TV scriptwriter, author, artist and travel writer. As an actor, look out for him in 2018 in The Terror, Red Sparrow, Papillon, The Alienist and Curtiz, where he plays the Hollywood producer Hal B. Wallis, so-called King of Casablanca (as in the 1942 movie). In the last 15 years or so, Scott has written scifi and comedy for people like SyFy UK – and been an Editor of Time Out magazine on three continents. He was also the madman behind Max’s Midnight Movies, a 26 x 30 minute TV series about cult cinema produced by Sony Pictures Television. Funny yet educational, ‘MMM’ breathed new life into the midnight movies genre. Last but not least, his travel writing sideline has taken Scott from Alaska to Buenos Aires, Florence to Hawaii. And of course Piran.